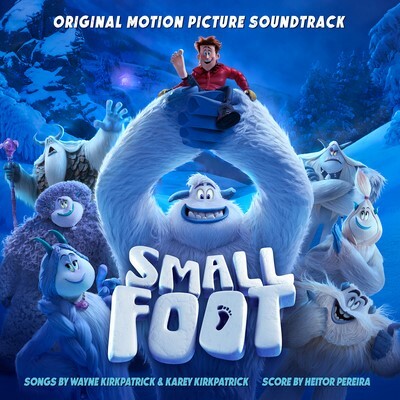 SMALLFOOT: ORIGINAL MOTION PICTURE SOUNDTRACK Out Now! WaterTower Music has just released the soundtrack for SMALLFOOT, an animated adventure for all ages from Warner Bros in theaters now. The film was one of the top releases this past weekend, generating over $23 million in domestic ticket sales in the US alone. The album also includes 18 tracks from Grammy-winning Brazilian composer Heitor Pereira. “Smallfoot” stars Channing Tatum (“The Book of Life,” the “Jump Street” films) as the yeti, Migo, and James Corden (“Peter Rabbit,” Trolls”) as the Smallfoot, Percy. Also starring are Zendaya (“Spider-Man: Homecoming”), Common (“Selma”), LeBron James (upcoming “Space Jam 2”), Danny DeVito (“The Lorax”), Gina Rodriguez (“Jane the Virgin”), Yara Shahidi (TV’s “Black-ish”), Ely Henry (TV’s “Justice League Action”), and Jimmy Tatro (“22 Jump Street”). The film is produced by Bonne Radford (“Curious George”), Glenn Ficarra (“Storks,” “This is Us,”) and John Requa (“Storks,” “This is Us”). Serving as executive producers are Nicholas Stoller, Phil Lord, Christopher Miller, Jared Stern, Karey Kirkpatrick, Sergio Pablos, Courtenay Valenti, and Allison Abbate. The creative team includes editor Peter Ettinger, and composer Heitor Pereira. Animation is by Sony Pictures Imageworks. THE BEST OF THE THREE STOOGES Brings Together their Biggest Nyuks in One Exclusive Time Life Collection, AVAILABLE NOW!